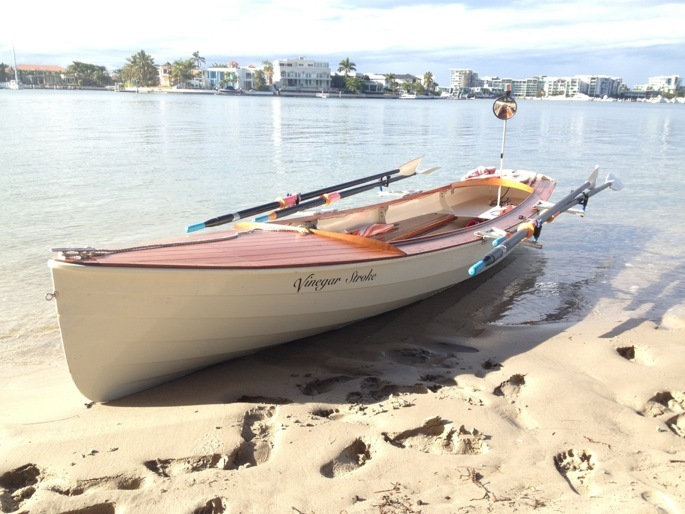 Gus Duncan made quite a few modifications to this Chesapeake Light Craft (www.clcboats.com) that had been originally built in Brisbane, Australia. 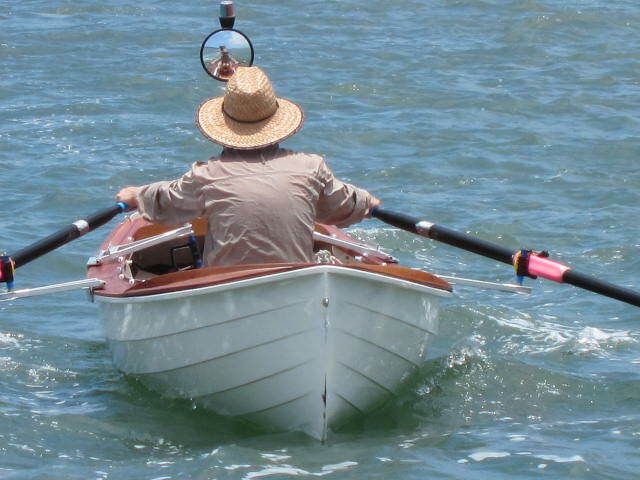 Gus rejected the standard single sliding seat on VINEGAR STROKE because it took up too much floor space and the fixed riggers for the oars made launching in spaces of limited width difficult. He installed a full-length sliding seat track on top of the lockers on each side of the boat. Then attached two sets of folding riggers to increase horsepower, storage space, and allow room to sleep. He put a hinged deck over the forward buoyancy compartment for more storage room and easier access to his gear. Gus also added an aft deck and some additional foam floatation. He put a luggage rack on the after deck that holds his solar panel or his dog in a basket. With room to sleep aboard now, he sewed a tent for camp cruising that opens amidships. VINEGAR STROKE’s beach dolly rolls onto a jet-ski trailer that Gus converted to a flat-bed trailer with fixed roof. With this arrangment, Gus can launch from a water’s edge and not have to worry about launching ramps. The fixed roof and a canvas cover gives VINEGAR STROKE dry storage when she’s not afloat.